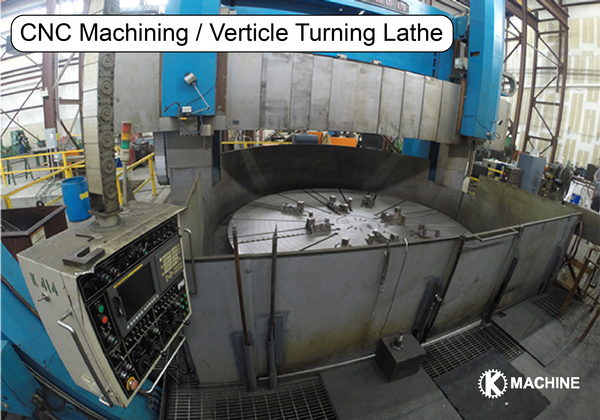 K Machine is a specialized machining services company and on-site industrial contractor focused on mobile, on-site machining of steam turbines and other heavy rotating equipment. We operate an 85,000 square foot industrial repair facility in Savannah, Georgia with smaller supporting facilities throughout the southern US. We specialize in emergency repairs to industrial equipment, specifically; steam turbines, pumps, high-pressure valves, gearboxes, Wood Yard booms and other heavy rotation equipment. We also manufacture steam turbine diaphragms and pressure plates on an expedited basis for turbine owners throughout the world. We are independent and therefore work on and have knowledge of all major turbine manufacturer's equipment. We typically operate 24 hours a day, year-round. 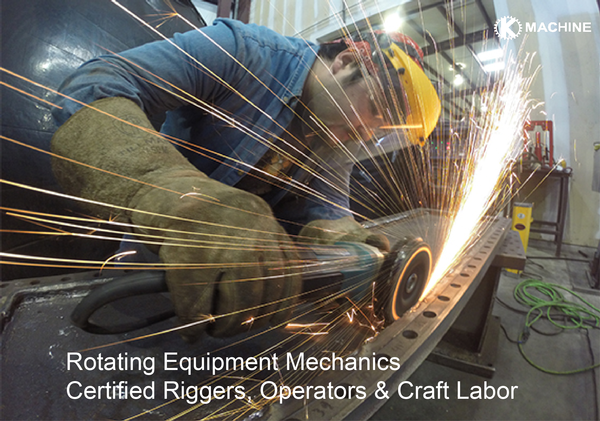 We employ about 125 full-time technicians, machinists, welders and other mechanical craftsmen whom have proven to be extremely loyal employees. The great-majority of our middle and senior-level staff have been repairing turbines, paper machines, gearboxes or similar equipment for 20+ years and are known by name and reputation within their field. We are strong believers in "the individual contributor" and hire people who have expertise in very unique areas of industrial repair. We then provide these people with the tools and the latitude needed to make decisions in the field, allocate appropriate resources and get the job done in the best interest of the customer. Our clients recognize value in our ability to be fast and flexible and are loyal to us in return. These principles are the basis of how we form our relationships. We are indeed a very diversified business. However, the majority of our projects consist of emergent repairs to heavy rotating equipment (turbines, gearboxes, et cetera). Power plants and/or pulp and paper mills are our main customers. We have an impressive shop facility (where much of our work is done) but we are mobile and our equipment is designed to be used "on-site" during an emergency. We are truly unique in our ability to repair many types of heavy rotating equipment under field conditions. Portable and stationary CNC machining services for the repair and manufacture of parts for heavy rotating equipment such as steam turbines, gearboxes, industrial blowers, augers, fans and pumps. 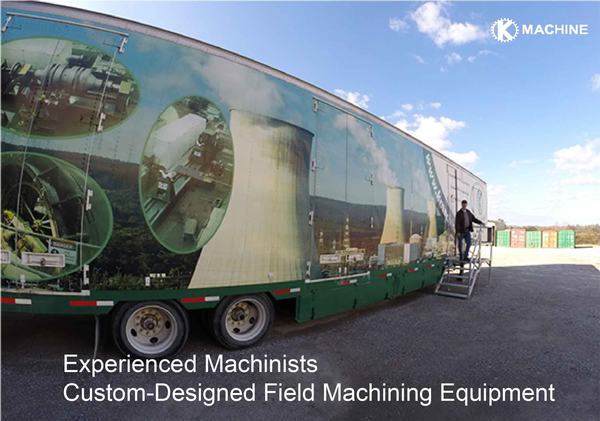 K Machine provides fully portable on-site machining services for the repair of large utility steam turbines. We provide, boring, stud removal, milling, and portable lathe machining. Our Superintendents are among the most-experienced in the world. Experienced power plant and paper mill millwrights for overhauling heavy rotating equipment. 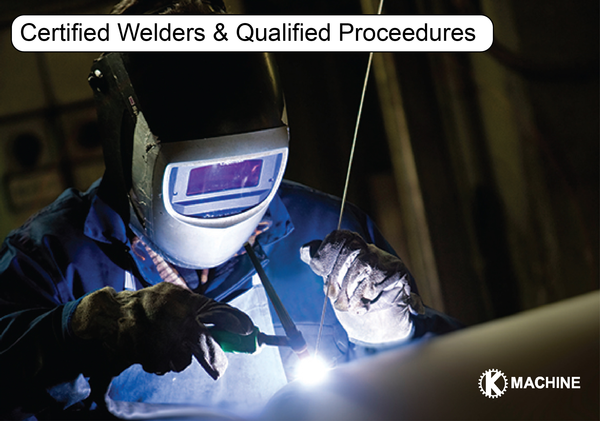 We arrive prepared with custom tool sets and required safety certifications. Rapid mobilization 24/7. K Machine's "Pump Components" division rebuilds pumps to orignal factory specifications. 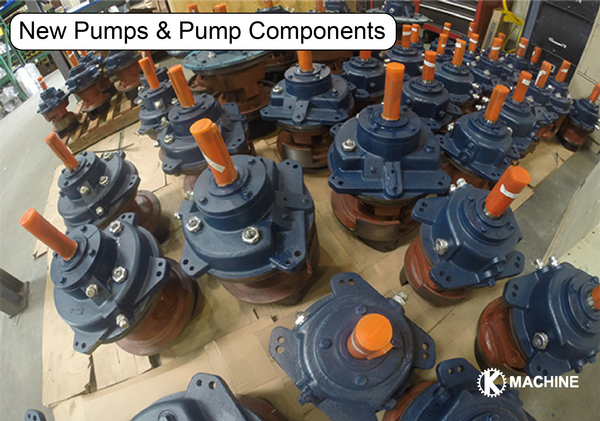 We also sell thousands of replacement components for pumps. We are an SKF Certified Rebuilder. Repair of Steam Turbine Diaphragms & High-Pressure Turbine Valves. Reverse Engineering & Short-Cycle Fabrication of Large Turbine Diaphragms. Portable Heat Treating Equipment & Technicians.